Tithi Bhattacharya reports back from the West Virginia teachers' strike. All photos by Tithi Bhattacharya. “This is West Virginia, right? We have all kinds of problems”, said Jay. I had just arrived at the Capitol in West Virginia. The solemn building was having trouble containing the surging sea of red within, striking teachers in their red shirts, chanting and cheering. I wanted to meet Jay, who was part of the small group of teachers who from October of last year had started talking to each other in a fb group. Jay was that organizer who knew everyone and could do the difficult work of transmuting individual grievances to collective politics. I was there to learn from him the anatomy of a strike. He listed four main problems in his state. First, West Virginia was the second poorest state in the country (Mississippi was the first). Second, and consequently, West Virginia’s teachers had the 47th lowest salary in the 50 states and the state had more than 700 teaching vacancies. Third, over the last ten years there had been serious cuts to the Public Employees Insurance Agency (PEIA) or the health insurance program for most teachers and state public employees. 200,000 people in a state of 1.8 million were served by PEIA. Deductibles had gone up 500% in the last five years, with no increase in wages. Last but by no means the least, the forces that could fight against these adversities were woefully divided. There were three different unions for the West Virginia schools. In a Right-to-Work state this may seem like a political windfall but in reality it was a major detriment to organizing. The American Federation of Teachers (AFT) the West Virginia Education Association (WVEA, which was the local designator for the National Education Association or NEA) and the West Virginia School Service Professional Association (WVSSPA) all competed for members and never engaged in joint actions against these harms that were common to all. Once unions had vacated their traditional role of being a tribune for workers, a more dangerous kind of organizing— unmediated by union bureaucracies and untrammelled by cautious "leaders" — began to emerge: self-organizing by the workers themselves. Many commentators on the West Virginia strike have been astounded by the suddenness of its eruption. To them it had come out of the blue, a tidal wave unexpected in the gentle stability of the everyday. But strikes do not come out of the blue. No strike is ever spontaneous — a “purely spontaneous” strike is one where you have not yet met the organizers. Every year there were routine public hearings about health insurance. They were "public" precisely because the politicians who headed these committees had ensured that the public had nothing to do with them. Their various reports, fortified by obscure policy phrases, guarded the inviolate privacy of the actual ways in which decisions were made. But in December, 2017 one such ordinary committee hearing held a surprise. This time militants, who had been collectively discussing and doing their research on PEIA, packed the meeting. They held a banner up at the state house: “health care not corporate welfare”. One of them was videoed following a politician asking him to raise the corporate income tax to pay for PEIA. That video went viral. Several strikers I spoke with later told me they had seen the video. It had to be the southern counties. This was coal country. People there had been steeled by bloody battles against mining bosses. The pasts of Matewan and Blair Mountain formed the fabric of family life. Once the rebels of the south had walked out and come down to the state house, others saw the “sea of red” being livestreamed from the capitol. Meanwhile, elsewhere that day Jay and his friends organized “walk-ins” in several counties where for 30 minutes before school teachers stood outside on informational picket lines sharing news and facts. As they stood, people honked their support further galvanizing a new confidence: we are in the right and other people are in this with us. The union bureaucracy quickly realized the dangerous power of that confidence and stepped in to domesticate it. The state leadership of all three unions, for the first time in history, worked in unison and announced a ballot to vote on “work action." The word strike hovered over their proceedings as an uneasy shadow of their member’s mood and capacity. The unions had to open the voting to members and non-members alike. Teachers and support staff flooded the meetings demanding a say in their own destiny, bucking the usual format of an election which merely decided the destiny of particular politicians. When the votes were counted, there was 80 per cent support for the strike. In an open rally at the statehouse, the union leaders announced the “work action." It was the worst day to have a rally — it was 40 degrees and raining. But on the steps of the capitol there were 10,000 people raring to walk off their jobs. If the union leadership thought they had finally reigned in the treacherous self-organizing of workers, they were wrong. Placing themselves at the head of a movement they did not start or build meant that their hold over it was anchored only by historical memory. The unions of memory of this particular working class were ones who had fought armed battles with mine bosses and their thugs. The current unions, trying to broker lukewarm deals with politicians and their corporate partners, were the ones the workers had. Certainly not the ones they deserved. 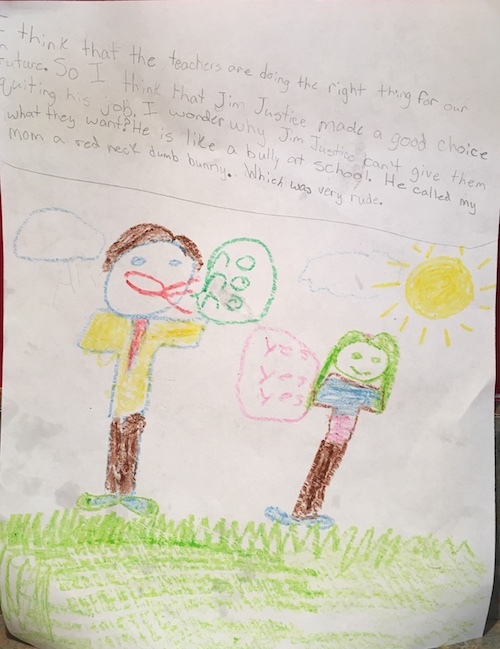 It should not come as a surprise then that when after deliberation with the legislature and union leaders, when the governor, James Justice, announced a 5% raise and a mere promise of a “task force” to look into PEIA, and the union hailed this as a victory, the teachers were furious. Everyone knew that the other word for a delaying tactic was “task force." And so it was that the teachers, in overwhelming numbers, defied their unions, and rejected the offer. It is important to realise that this was not a conscious rejection by rank and file workers of the union per se. Many optimists on the left have already greeted this move as such. Instead, what the act represented was a contestation between a grounded historical memory of “the union” handed down by miner father to his teacher daughter/son, and the actual reality of a deracinated union whose goal was to weather neoliberalism, not to fight it. Striker after striker told me that they have faith in the union. That the unions were working hard. In the same breath they said if they didn't like what the union presented as the final offer, they would stay out. It is this variegated simultaneity of opposites, mottled by history and sobered by the present, that the workers were articulating, not any simple acceptance or rejection of unions. This is not to underestimate the grassroots nature of the struggle, but to highlight it. Teachers, in practice, had both defied the union and created their own, albeit temporary, structures of collective decision making. Their political approach was simply playing catch up with their concrete deeds. If the vast majority of women strikers did not regard themselves to be feminists, feminism, to paraphrase a revolutionary, certainly was not disregarding the strike. The strike, the conditions that led to the strike, the way the strike unfolded were all deeply gendered. The health insurance issue was not just about rising premium costs. It was about the body. “In the new insurance program, we had to get a Fitbit,” Anna, a miner’s daughter from Mingo county and a teacher with 30 years of teaching behind her, told me. One had to record every movement, measure various parts of one’s body, and enter the data into the system to show one’s commitment to self-care. The premium was decided on the basis of points one earned rewarding the intensity of one’s personal exercise regime, body weight, and past health record. The Foucauldian degree of self-monitoring required to please the system and be rewarded for it, was extraordinary. There were no tiers for the system. “I am an older teacher,” said Anna, “I have had knee replacement. There is no way I can do what a 25-year-old can. They did not even distinguish between males and females.” It was an emblem of neoliberal "equality." Where real bodies were always buffeted by wider currents of age, income, race, and gender, such "equality" merely obscured the fact that only certain kinds of bodies would be rewarded, and Anna knew it would not be hers. “So we started having meetings, at the local and county levels," and Anna’s county was one of the first to walk out, way before the union authorized it. It is not coincidental that the national average of women as teachers in the US is between 75–80%. Teaching is seen as "care work," traditionally understood as "women’s work." Beyond the pigeonholing, however, the high percentage of women as teachers has shaped the profession in important, gendered ways. The West Virginia strikers might see their political identity in a de-gendered way, i.e. as workers alone, but they were, in their lived experience, mothers, church members, community leaders, and breadwinners. Domestic labour and wage labour were always layered and conjoined. This was expressed in how quickly wider layers of the community were immediately pulled into the strike and reflected the disproportionate ways in which women, rather than men, create social and community networks. “We have been serving hot meals to the kids," said Jackie, a striker from the small town of Blacksville. “Our city hall has been opened, kids have been coming in to be fed. The churches have been making hot meals and taking it to the people’s houses.” The school was not just a place of learning for students, it was also a public food program that provided food. So teachers had to be more than educators. And because teachers integrated the home to the school, did not consign love and care to the space of home alone, the children certainly knew how to respond to the strike. “I have had students offer to bring me heaters when it was cold on the picket line” Rhonda a striker from Fellowsville said. “One offered to bring me lunch, they are so thoughtful. Some of them said ‘you do need a raise you do need healthcare.'" Rhonda herself, as a highschooler during the 1990 strike, had organized support for her striking teachers. Continuity and community braided labour history in West Virginia. I think that the teachers are doing the right thing for our future. So I think Jim Justice made a good choice quiting [sic] his job, I wonder why Jim Justice can’t give them what they want? He is like a bully at school. He called my mon a red neck dumb bunny. Which was very rude. An alternative vision of the world is always woven into the strike as a category. Strikes are articulations of an "ought" — an active movement away from "'is." The teachers had very clear, utterly non-utopian solutions to how the wage and benefit question could be resolved. And easily. Is it for our roads? Because our roads are terrible. Is it for our schools? You ought to see how run down some of our buildings are. Is it for our children? We have got children who are living in abusive homes right now who cannot be placed somewhere else because we do not have the money or resources to get them out of there. We are not paying social workers enough. So who is getting the benefits from big energy’s golden egg? This then was the solution, and every striker I spoke it repeated it: tax the corporations to pay for infrastructure and higher wages. Tax the rich to pay for those who really create wealth in society and create the warp and weft of life and work. It was the most practical of solutions, it was also the most anti-capitalist, threatening simultaneously the power of the political class which was premised upon the profits from the economic system. The restaurants of Charleston regularly witnessed oil and gas company bosses buying steak dinners for senators. The strike disrupted those dinners, talking instead as it did of bread and equal life chances for all. The strike is now past it’s one week mark. Communication workers in West Virginia are threatening to follow suit as are teachers in Oklahoma. We might be seeing fault lines in the thick crust of neoliberal "labour peace," brought to us by capital and the labour bureaucracy alike. Questions of equality and fairness are back on the table. Thank you Hailey and all your teachers for re-introducing America to two old words: "Class struggle."